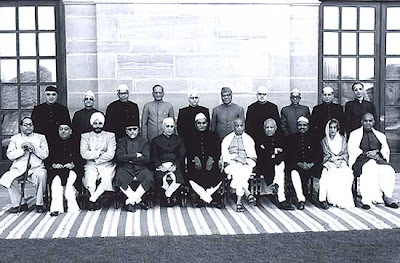 PS:It took me a lot of googling to get a list of India's first cabinet ministers and the wikipedia does not have any record of India's first cabinet. It is an irony that even the official website of the Indian Government www.india.gov.in has no record of these greatest Indians. It does not feature even a photograph of Raj Kumari Amrit Kaur( first woman cabinet minister)!! It is highly worrying that the Indian Government is not properly utilizing its website. It is important that the moments of post Independence Indian history are properly recorded, and its heroes are properly recognized. Else the future generation may never learn about the architects of India.